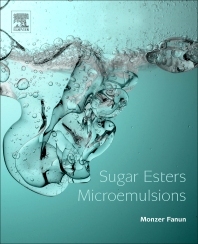 Sugar Esters Microemulsions covers recent advances in the formulation, characterization and applications of sugar esters microemulsions. This book comprehensibly covers a decade of experience on using sugar surfactants for various applications. It enables researchers in the field to follow a tested methodology in choosing the best sugar surfactant formulation that fits an application of interest. This book is the ultimate reference for all those in industry or academy working in the field of microemulsions in general and sugar esters in particular. Professor M. Fanun is Associate Professor at the Colloids and Surfaces Research Center, Al-Quds University, Palestine. He has a PhD in Applied Chemistry, Casali Institute of Applied Chemistry, Hebrew University of Jerusalem, Israel. His is Fellow of the Palestinian Academy for Science and Technology (PALSAT), Member of the European Colloid and Interface Society (ECIS) and Member of the Bethlehem Academics Association. He published 3 books, several book chapters, and more than 70 articles in international scientific journals.